Operational across 100 Korku tribe dominated villages of Khalwa Block in Khandwa district in MP. It early tacks the nutrition status of U5 children and follows it up with Home based counseling focused on diet diversification and better child care, doorstep diagnosis and treatment of common illness and thereby helps most of the children recover at homes in a non-facility based care. The effort is supplemented by promoting Backyard Nutrition Gardens, Behavior Change communication and transforming Anganwadis into child friendly spaces. This is the core program that aims at helping scores of children recover at homes and in a non-facility based community care. For this end the U5 children are early screened using the anthropometric measures a like age, weigh, height, MUAC and head circumference. The identified malnourished children are taken in the program. Some of the malnourished children found with multiple medical complications are assisted to reach Nutrition Rehab Centers. These numbers are usually very small. During the reported period we 2254 malnourished children were so identified and 253 were referred to NRCs. 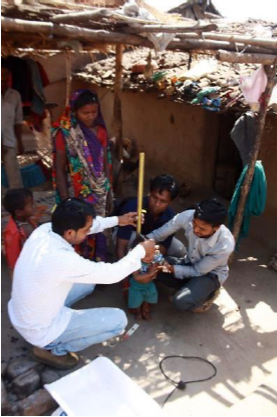 The identified malnourished children are followed-up regularly with home visits, nutritional counseling, helping mothers to diversify diets, support to families by way of seeds to grow vegetables and Millet and raise Backyard poultry. The mothers are assisted to access food and nutrition entitlements especially from Anganwadi and PDS Ration shops. A mobile team too follow-up the cases through periodic visits, diagnosis and provision of medicines. They too counsel mother of various aspects of health and nutrition and vaccinations. The frontline staff also conduct regular meetings, community trainings and awareness campaigns to not only help the victim families participate in the program but in the process have better knowledge and skills at better care of their children as they grow up. 79 meetings could be organized. For children below 03 years and being most susceptible to onslaught of malnutrition are cared for through community crèches. Presently 08 such crèches are piloted. Daily wage earning mothers unable to leave the kid at home, leave their kids. They too participate through visits, meetings and sharing resources like firewood or vegetables grown in their fields. More than half of the 160 children cared for through these crèches have shown steady weight gain and less proneness to sickness. 33 Grain Banks now wholly community managed have continued to help the poo access grains in peak hunger times. It now has 373 members and 5323 kilograms of grains could be provided to hunger prone families. This year too we complemented the government efforts, through conducting Health camps in remote locations and outreaching left out children (ones living in remote hamlets) with administering Vit.A doses. 2776 children across 33 distant villages were so helped. Similarly 20 Health camps were organized that could significantly bridge the service delivery gap through outreaching 435 women, 839 children and 435 men with diagnosis and provision of medicines. Assistance was also extended in Pulse Polio Campaign and Suposhan Abhiyan. 36 Anganwadis were extended clothing and Toys support and events were provided to enhance the participation of mothers and help kids stays longer at the centers. Voluntary grain support was received that was extended to severely malnourished children. The dialogue with government grassroots departments, Health and ICDS in particular was facilitated. 7 grassroots experience sharing session were held apart from ICDS sector level dialogue with grassroots functionaries.